lubana.com – Above all we are Sikh First! Above all we are Sikh First! New year and new website! According to British records 33% of the Labana were baptised Sikhs and were found primarily in the Lahore, Gujranwala, and Sialkot areas. The Labanas (along with many other groups) saw the highest conversions into Sikhism during 1881 1891. According to George Armand Furse, “The Jut and Lobana castes of Sikhs possess in a high degree the useful knowledge of the lading and care of beasts of burden”. The name Laban may refer to the transport of salt. “The term Labana appears to be derived out from loon (salt) and bana means trade, and the lubana, Lobana or libana was doubtless the great salt-carrying and salt trading caste”. Acc. to Gurmat Parkash, Magazine by SGPC, Lobana also means who wear Iron Dress, i.e dress of Military person. They mentioned Lobana were Military persons who served in Guru’s army. These are also called Bahrupia, on account of their versatility in adopting many professions. Labanki, the dialect of Labanas, is a mixture of Marwari, Saraiki, Gujarati, and Marathi. 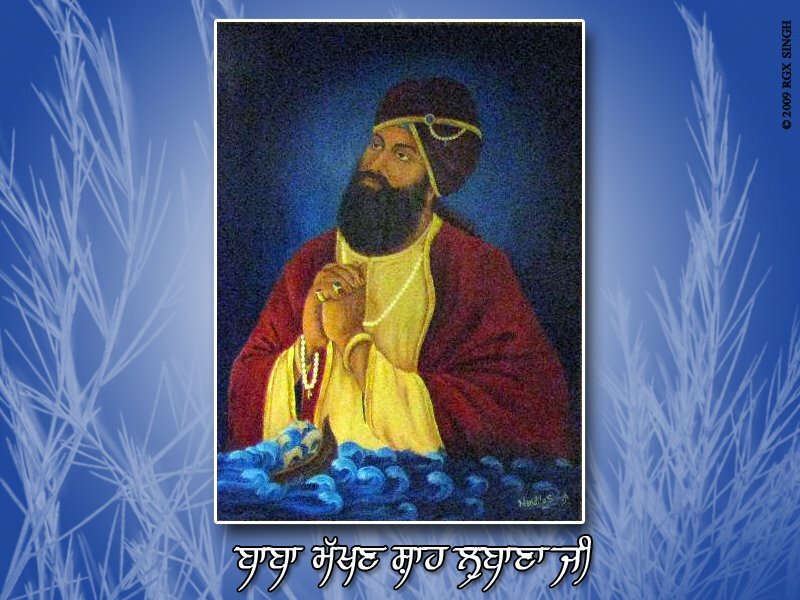 After Guru Harkrishan, the eighth Guru of Sikhism, died in 1664, there was confusion about the identification of his successor. According to Sikh legends, Makhan Shah, a great merchant of the Labana tribe, identified Guru Teg Bahadur as the successor of Guru Harkrishan. Makhan Shah was very helpful to Guru Teg Bahadur during his pontificate. The Labanas participated in battles fought by the tenth Guru. During the Misl period , the Labanas joined the services of various “Misldars”. During the eighteenth century the Labanas began to follow a settled way of life. The Labanas of Lower Indus, Gujranwala and Jhang, settled as cultivators during Sikh rule. Wherever the Labanas settled they named their villages as Tandas. Tanda in Labanki dialect means a travelling body encampment. In Kangra district, the Lobanas had four hamlets, each called Tanda. By the mid-nineteenth century, the Lobanas at some places owned not only parts of villages, but also entire villages and even groups of villages. They were chiefly found in the Punjab during the Sikh rule. Labanas were listed as a martial race by the British. Labanas are said to have nomadic roots but are not related to the Lambada or Labada tribe of Andhra. There are some who believe that they are of the same stock as the Gypsies or Roma people of Europe. Labanas have been linked with Gypsies from Turkey. Today Labana is a landholding-rich community of Punjab. A large number of Labanas are settled abroad in western countries. The people are hard-working and uplifted the community again to its pride, which was in crisis during the early years of partition. Most Sikh Labanas are of western Punjab origin (now in Pakistan) and are called Panahi, while a smaller ratio are of East Punjab origin and are called Jaddi. Special note: This site is not intend to promote cast system and is made to provide history and where up to Lubana community is. All your discussion based comments are welcomed and vulgar language or disrespect of other communities, faith and religion is not allowed. Very Good Work RGX Singh….. I Like the Caption line …. Above all we are Sikhs First. Thanx for this site and history about our past. history pad ke bahut fakar mehsoos hunda hai aj. par sade aj de lubane apni disha to bhatak ke puthe kamma wal pai gaye han te sab ton wadda kod jo sade lubanyea de vich aa gayea hai oh haidaj kirpa karke is nu khatam karan ch ik duje di madad karo. apni history ni mitti ch rullan to bachayie. lubanyea da na roshan karyie. that,s great effort to show other people & our(lubana),what we was & and what we are.great history,great contribution in sikhism ,great identity.i love the method the way you explain all this topic.great inspiration for those who belong to us but they dont know what they are.anyway i give you my good wishes in future to find some more about this topic.regards………………..DIPPY TANDI. very nice and thanks for details, further request you to give branches of our caste such as sub castes as myself from Mathoun,Ghotras and Multanis. bht wadia lga aj apni lubana history pad ke….ajj pata lga e ki sadi lubana biradri ne guru gher lye bht kuj kita par ajj sade lubanea vich bht jyada ik duje lye irkha e nafrat peda ho gye e ajj de munde apni cast da nam khrab kar rhe ne ohna nu change pase lg ke apni biradri da naam roshn krna chahida e…….our history is realy great…..
22g…. koi singer chahida aa… apne 1 mitar ne geet likhe aa… bs apna kole pahe ni haige… mai tan AMAN MULTANI nu laban aya c… pr menu tan apni caste da etihas ajj pta chalya aa… 22 g plz koi gayak hove tan daso…. gane bde vadia likhe gye ne…. gujral.koolas.bharot,gaade. Are our sub castes around ropar district,punjab. bai ji mainu inna nahi c pata apni cast di history bare par ajj pata leg geya. really encouraged after reading this………..lubana rocks………..
very very good effort.we all lubanas are on high profile posts so never hide your identity. Thankas to every lubana and all guru de sikh. So I gave my best wishes from the birth palace of KHALSA sri Anandpur sahib. It’s my pleasure reading this relevant info. about lubana history. Even I’m belonged to this cast. But before I didn’t knew that how were we kept over lubana cast. Thanx buddy and I wish you post more latest info…. thanks for the visit. keep supporting , don’t forget to subscribe the blog for latest news on Lubana community. you can share ….artist,news, inspiration, personality or any thing related to community. Sukhe veer i am also from gurdaspur my village is kahnuwan. One of my relative’s gott is gujjar. I will try ask him about thier satti and let you know if i get some clue. His village is fero chechi. We have ghotra and pelia satti in kahnuwan but pelias now only practice guru granth sahib there and no bakra bali any more. Lubanas are blessed by 9th guru ans so by waheguru. feeling good to reading our history…ik pind saada v a…jehra punjab toh door paonta sahib de nede basya va…paonta toh 19 km piche…kolar naa da pind a..5km da pind a apna sab toh vda…. Jugg jugg jie tuhada pind. I want to know about our lubana community I’m from Jammu and Kashmir but now I’m living in Ireland . Their are more than 1lac lubana in j&k till date. i am very suprised that we have a great history. i am proud to be a lubana.